Do you like to sing jazz? 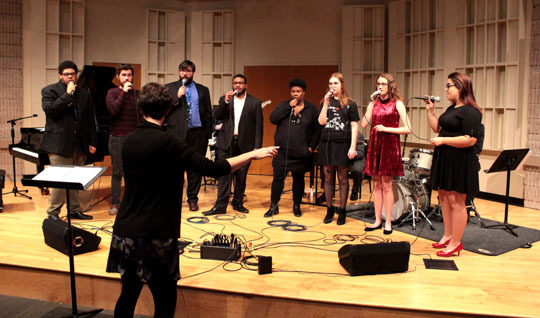 Audition for the University’s Vocalstra, a vocal jazz ensemble founded by legendary singer Jon Hendricks. This ensemble performs a variety of repertoire, including jazz standards, blues, vocalese (a genre of jazz singing in which words are set to instrumental recordings), and other contemporary genres. Auditions will be held Wednesday, Jan. 17, and Monday, Jan. 22, from 4 to 7 p.m. in Center for Performing Arts Room 1017. Singers should prepare a song, preferably in the jazz style if possible. Auditions will be held in 10-minute increments. Students of all majors are invited to sign up for a time here. “We are searching for new, passionate and committed members,” said Dr. Ellie Martin, instructor in the UT Music Department and co-director of Vocalstra. Students who have a conflict with the audition times or who have questions should contact Martin at lee.martin@utoledo.edu. This entry was posted on Friday, January 12th, 2018 at 3:57 am and is filed under Arts, Arts and Letters, UToday .